The 6610 appliance outlet from Schurter sold through Koloona Industries uses IDC terminal technology. The 6610 appliance outlet can reduce labour/assembly costs by supporting an efficient assembly method. Multiple outlets can be banked and wire connections can be bussed, connecting the terminals all at once. The 6610 appliance outlet is suitable for power distribution units and appliances with multiple power outputs throughout assembly services, electrical distribution systems, electronic product assembly, manufacturing solutions, medical appliances and power supply design. The IEC F appliance outlet is equipped with IDC terminals and available for two different wiring versions, “along” and “across” to the connector pin axis. The terminals accept insulated solid wires with CSA AWG12/2.5mm² and AWG16/1.0-1.5mm². 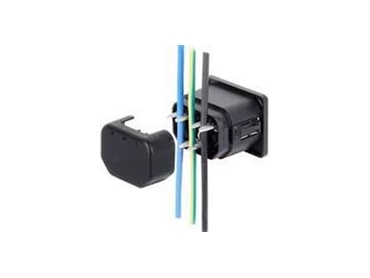 The component is designed for snap-in mounting and comes with a protection cover, aiding in the pressing of the wires and at the same time protecting from electrical shocks.